Engineers at the University of California San Diego have developed a super-hydrophobic surface that can be used to generate electrical voltage. When salt water flows over this specially patterned surface, it can produce at least 50 millivolts. The proof-of-concept work could lead to the development of new power sources for lab-on-a-chip platforms and other microfluidics devices. It could someday be extended to energy harvesting methods in water desalination plants, researchers said. A team of researchers led by Prab Bandaru, a professor of mechanical and aerospace engineering at the UC San Diego Jacobs School of Engineering, and first author Bei Fan, a graduate student in Bandaru’s research group, published their work in the Oct. 3 issue of Nature Communications. The main idea behind this work is to create electrical voltage by moving ions over a charged surface. And the faster you can move these ions, the more voltage you can generate, explained Bandaru. Bandaru’s team created a surface so hydrophobic that it enables water (and any ions it carries) to flow faster when passing over. The surface also holds a negative charge, so a rapid flow of positive ions in salt water with respect to this negatively charged surface results in an electrical potential difference, creating an electrical voltage. “The reduced friction from this surface as well as the consequent electrical interactions helps to obtain significantly enhanced electrical voltage,” said Bandaru. The surface was made by etching tiny ridges into a silicon substrate and then filling the ridges with oil (such as synthetic motor oil used for lubrication). 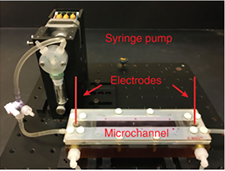 In tests, dilute salt water was transported by syringe pump over the surface in a microfluidic channel, and then the voltage was measured across the ends of the channel. There have been previous reports on super-hydrophobic, or so-called “lotus leaf” surfaces designed to speed up fluid flow at the surface. However, these surfaces have so far been patterned with tiny air pockets—and since air does not hold charge, the result is a smaller electric potential difference and thus, a smaller voltage. By replacing air with a liquid like synthetic oil—which holds charge and won’t mix with salt water—Bandaru and Fan created a surface that produces at least 50 percent more electrical voltage than previous designs. According to Bandaru, higher voltages may also be obtained through faster liquid velocities and narrower and longer channels. Moving forward, the team is working on creating channels with these patterned surfaces that can produce more electrical power. Full paper: “Enhanced voltage generation through electrolyte flow on liquid filled surfaces.” Co-authors include A. Bhattacharya, UC San Diego. This work was supported by the National Science Foundation (CMMI 1246800 and CBET 1606192).